Anyway, New Years Eve... And yes, while I'm aware that Rosh HaShanah marks the beginning of the new year, there is something powerful and moving about December 31st. The world seems full of hope, full of promise, full of ambition for the coming year. And whether that carries well into the year or ends at 12:01, it doesn't matter. 2015 was hard for our family. Like really hard. There were challenges and obstacles around almost every corner. From pregnancy complications to the NICU, medical emergencies, surgery and working diagnoses for both of our boys, it was real and harsh and raw. We did our best to keep things as positive and normal, as we could, for the boys. We had a first birthday party, went to the zoo and play places. We had pj days and Paw Patrol days, running in the park, cuddles, laughs and smiles. And it got us through. But today. Today is December 31st. And tomorrow this year will be gone. It'll be another chapter in our lives. A chapter that broke us down a little so that we could become even stronger. There are three words I want to focus on this year. I want to celebrate. I want to celebrate everything. Every inch of progress our boys make. Every smile. Every milestone, big or small. I want to celebrate Monday and Wednesday and birthdays and good weather. I want a calendar filled with more than medical appointments and with more family fun days. I want to celebrate it all. I want to find the good and make happy memories and live. 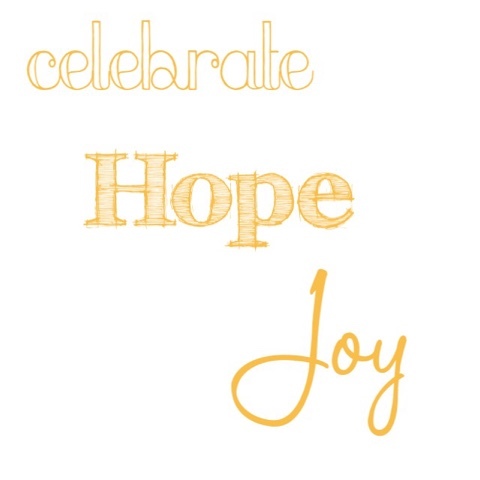 I want our lives to be filled with hope. Hope for progress and therapies and that every day will be a good day, that everything will be okay. Will there be sleep regressions and teething, silly arguments over nothing and toddler tantrums? Yes, yes there will be. But there will be hope too. And if those are the worst things we'll have to face, then I welcome them with open arms. Joy. I want there to be so much joy. The kind of joy that is all encompassing and overwhelming. The kind of joy that takes your breath away and leaves you awash in gratitude and wonder. The kind of joy when Y learns something new or N beats the odds. The kind of joy that melts mommy guilt and bickering and tantrums. Joy and laughter and smiles. Everyday. To find a reason for joy every. single. day. Do we always get what we want? No, no we don't. But we can hope. We can be joyful through it all. And when we do get what we want? When we get what we so desperately need? We celebrate. Mini Chocolate Pumpkin Bundt Cakes! Let's call life with two under two... busy. In the past few months, "busy" has taken on a whole new dimension. Working through a few different diagnoses for both boys, has left our schedule overtaken by doctors appointments and hospital visits. As difficult as it has been, these two little boys are incredibly amazing. N is constantly smiling and Y is pretty much one of my favorite people to hang out with! They're the bravest, strongest boys and I could not be prouder to be their Mommy - or so I think! Everyday they impress me even more! (I mean let's be real, y'know between the infant sleep regressions and toddlerness, haha!). Speaking of chocolate cake, you know what makes even the tastiest desserts even better? When they're baked as miniature versions!! With 2016 quickly approaching, I'm so excited to share with you a few of my favorite products from the past year! 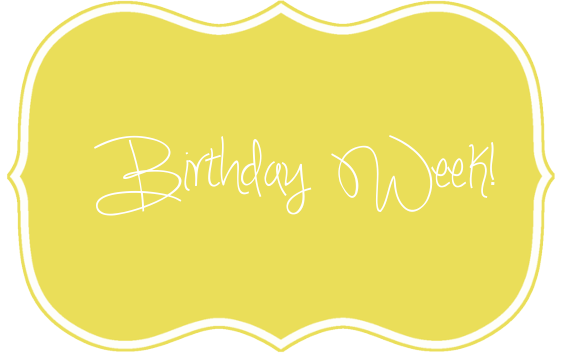 Today I'll start with bakeware and throughout the month will highlight cookbooks, kids items and more! Nordic Ware has certainly taken the lead and enhanced our cooking and baking through innovative products this year. We use our Flare pan, multiple times a week. Yes it may just be a frying pan, but when we had to be out of our home for a few months, it was one of the first things we packed with us to bring to my parents house! Don't even get me started on our dutch oven! It's lightweight and beautiful features are only outdone by how well it cooks basically everything we've attempted in it so far. But you guys know me, and if you follow my Instagram feed, you'll know that baking is my first love in the kitchen. And that's where this pretty great pan comes in. Like I said, life with two under two can get pretty busy, even without all the extras we have going on. So what's better than a cake pan, with a gorgeous design that makes your baking fancy without any effort? A cake pan that does that very same thing, THIRTY times over. Yes THIRTY. 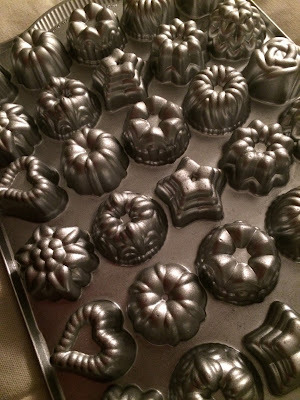 The Bundt Tea Cakes and Candies pan, makes 30 miniature classic Nordic Ware bundt cakes! Think of the endless possibilities. A cute platter of mini cakes for your hostess the next time you're out for Shabbos, perhaps? Or maybe a variety of flavors of mini cakes on cake stands displayed at your next event! An addition to your shalach manos - never too early to start planning! A tray of mini cakes sent to the office or packaged beautifully for a neighbor, teacher, new mom or housewarming gift? It's also perfect for a bake sale or last minute treats for an entire class! Or on a simpler level, if you're anything like me, mini bite size cakes as a treat to last the day, afternoon, week, when you're craving a baked good but don't want to go too crazy. Also, they're the perfect size for dessert for Y (although, like his Mama, he prefers two in a sitting...). Thirty mini cakes in one shot! I can't get over it. In true Nordic Ware fashion, the cast aluminum is sturdy and results in beautifully and evenly baked mini cakes. It's non stick surface ensures the cakes pop out beautifully, retaining their design. You can even use it to make mini candies, adding versatility to it's list of features including heirloom quality and a lifetime guarantee. It's basically a Mommy baker's ideal gift! I've included a recipe below that's also super easy for the Mom on the go who wants a delicious and beautiful tray of desserts! Excuse me, as I'm off to have thirty one mini cake, before bed! Using a half tea spoon measurement, scoop batter into mini bundt cake form. This pan was generously provided by Nordic Ware. The thoughts and opinions expressed within this review are solely my own. I'm the kind of girl who would be significantly happier taking a walk with M around Williams Sonoma than Tiffany. Any inclination to change? Nope. While shiny diamonds are pretty awesome in their own right, they've got nothing on a shiny dutch oven! When this arrived at my door a few weeks ago, there may have been some hysteria. My love for all things bake/cookware is wonderful (unless you're approaching it from a "financial" or "space in our tiny kitchen" angle... but hey, how about we just don't?). And while a lot of the time, items tend to be more pretty than they are useful, it was most definitely not the case here! As I've mentioned time and again, my favorite part of cooking is the connection it provides to the past and to the incredible people in my life, from my grandparents to my parents, presently. I love that I can make a cake in my kitchen, and the apartment will smell just like my grandmother's home when I was 10. I love that after messaging my Mom a million times over a recipe and instructions, once it's complete, I can give my boys a dish my Mom would make me. I've honestly never felt a greater connection to the memories of being around my grandmother while she prepared dinner, than I did while preparing this meal. For one, I started at about noon. My grandmother would always start making dinner shortly after breakfast. It wasn't that dinner necessarily needed that much time to cook, but it was when she had the time to dedicate to it and ensure it'd be ready and no one would have to wait to eat. I'll be honest, I'm usually not so great with the "no one waiting" part. Oftentimes, dinner will only be ready (read: I'll start cooking) after M gets home. This was different though. N was napping, Y was happily sitting in his high chair with snacks and excited to watch Mommy cook, and I had both the ingredients and energy to get started! Even more significant than starting at noon, I made this from intuition and preference rather than from ratios and research. I struggled to keep the measuring spoons in the drawer, and approached the addition of spices from a intuitive angle. I don't think I ever saw my grandmother use an actual measuring spoon (which may also explain why I haven't been able to recreate a few of her recipes...). I stuck to what we like, rather than what would be expected and the reward was an incredible dish arising from the mingling of flavors and simplicity. It's no secret that I prefer recipes that involve minimal ingredients, prep time and clean up. This recipe used exactly two dishes: the dutch oven itself, and a plate for preparing the meat. That's it! And the dutch oven is so beautiful in and of itself, that it transfers seamlessly to the table and is a gorgeous serving dish. A noteworthy feature is it's weightlessness. I've always had my eye on cast iron cookware, but being an itsy bitsy balebusta there's no way I'd be able to lift it, once full, in and out of the oven. Not the case here! This 3qt dutch oven was light enough, even when full, that I could easily take it from counter, to oven to table with no struggle at all. Nordic Ware's dutch oven is made of cast aluminium. 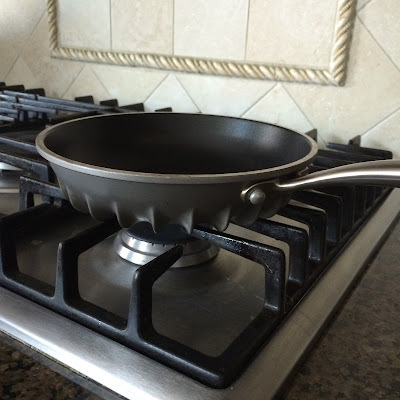 The Pro Cast Traditions line is sturdy, the heat conduction properties are excellent and the value and affordability make them accessible for those looking to purchase a heirloom quality pan without spending hundreds. There's no questioning the quality, and the fact that the product is so gorgeous, with a beautiful, gleaming cranberry colour, is an added bonus! Also, this specific model is the 3qt and it was large enough to double this recipe, at least! It's the perfect size for our family and a filling weeknight dinner! The dish came out absolutely excellently! The potatoes were soft, the meat pulled smoothly and the garlic was roasted to perfection. Everything cooked evenly and retained its moisture. Both M & our toddler Y, absolutely loved this and clean up at the end was as easy as the meal prep! 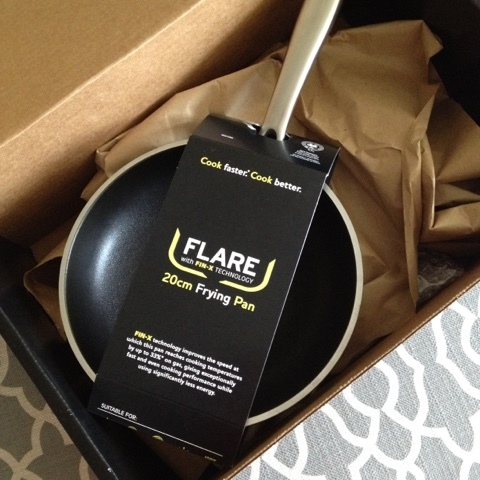 If you're looking to add to your cookware collection, looking for the perfect gift or simply want to elevate your cooking with minimal effort, this is the line you should look to! *I've added the measurements for the spices, but feel free to add them at your discretion! Mix the potatoes to ensure even distribution. On a separate plate, mix the BBQ sauce and brown sugar. Dip the steak in the mix until covered well on both sides. Add to dutch oven. Peel garlic cloves and add to dutch oven. Remove, stir potatoes and add sweet red wine. Return to oven and cook for an additional hour, checking occasionally. Ready to serve directly to table! I was generously provided with this Pro Cast Traditions 3qt Cranberry Dutch Oven by Nordic Ware. The opinions and experience provided within this post are completely my own. Having graduated with a double major in English & Art History, I’ll be the first to say that math and science aren’t my strong suit. I took all required classes but I’m way more of a Chaucer and Caravaggio kinda girl, than the Galileo or Einstein type. There’s no doubting that my willingness to jump into anything scientific has grown exponentially, given that the science of baking and cooking is definitely a science that speaks to me. And of course, whenever the division needed to figure out how much that new bundt pan will cost me on sale is necessary, I’m your girl (or y’know the girl that will ask my husband exactly how much we'll be saving…). Having said all that, my list of favorite scientists is starting to grow, and on that list? Dr. Thomas Povey, Professor of Engineering at Oxford. He’s a rocket scientist who, among other feats, seriously cut down my cooking time in the kitchen. I like to think of him as the patron scientist of Mama’s to two under two. Nordic Ware’s recent introduction of the Flare Cookware line has brought an innovative, practical and revolutionary product, to a market that could use this ingenuity. Dr. Povey used his experience of trying to boil water on a camp stove while mountain climbing in the Alps (only slightly more difficult than trying to boil water with a newborn and toddler in the background) to develop a product that would both heat up and cook food faster, more evenly and efficiently. With the addition of scales to the bottom of the pan, the absorption of the stoves heat energy is quicker and held, not dissipating. This result in less time preheating, less cooking time and less energy. With Flare, less is more. More time to enjoy breakfast and less time cooking it. More time to read stories and less time scrambling eggs. In my opinion, recipes need to be quick and easy and the fewer bowls or items needed for prep, and the less time in the kitchen the better. While pancakes definitely meet the first criteria, for some reason they always take me for.ev.er. 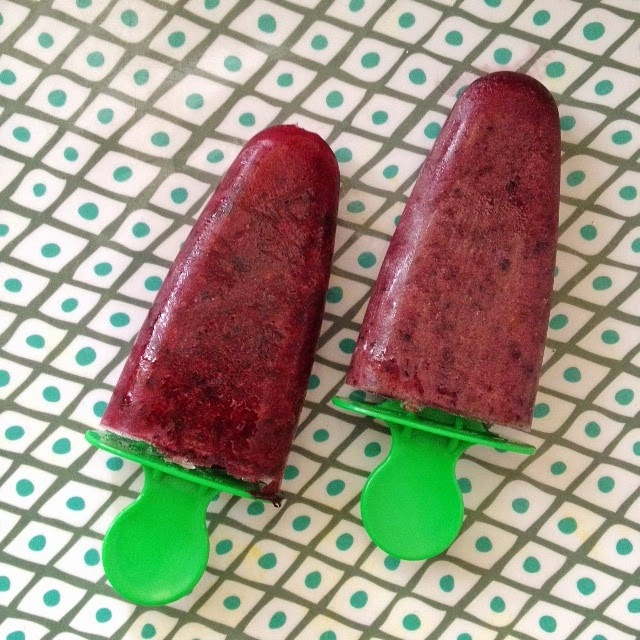 They’re so easy and with the addition of fruits and altering which flour I use or which additions I make, are a quick and healthy meal option for our toddler. But what toddler (or Mom for that matter) is patient enough for the process of ladling batter onto a frying pan over and over and over again, with later batches burning, early batches taking ridiculously long to cook and so on? And have you tried to clean a pan after making a dozen pancakes? Not the case now! I literally made 10, evenly and perfectly cooked pancakes, in 15 minutes. And the pan wiped clean afterwards. Definite to do list items for this week? 1. Get yourself a Flare pan. 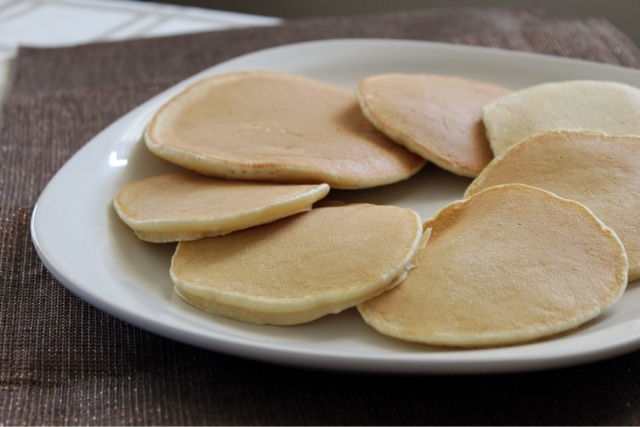 Using a ladle, fill the surface area of the pan with batter, leaving enough room to flip the pancake with a spatula. *Times may vary depending on your stove. These times are based on our electric stove. Disclaimer: The 8" Flare pan used and mentioned within the post, was generously provided by Nordic Ware. All opinions expressed above are completely my own. 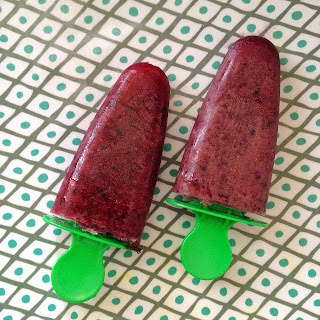 When I shared these coconut berry pops a couple of months ago, I was exhausted from chasing around our one year old and having just moved (at 8 months pregnant, nonetheless!). Now that there's a new, super cute reason to be exhausted, I'm not only loving recipes that are quick to make and require few ingredients, but ones which are quick to eat too! You see, either I have to eat quickly because there are only a few minutes left during nap time, after my to do list has been partially tackled, or for instance, my 18 month old is standing in front of me, longingly staring at whatever it is that I'm eating (and not moving until he's had a piece... Or half!). So these days, I'm absolutely loving smoothies, muffins and anything else I can make quickly, add nutrients to and eat on the go! Coconut water has been a great help in meeting all three! Using it as a substitute for water in smoothies, is a simple and effective way to add electrolytes and a little boost. And when your muffins may have a tad more chocolate chips than a healthy muffin should, adding coconut water is an easy way to add nutrients! 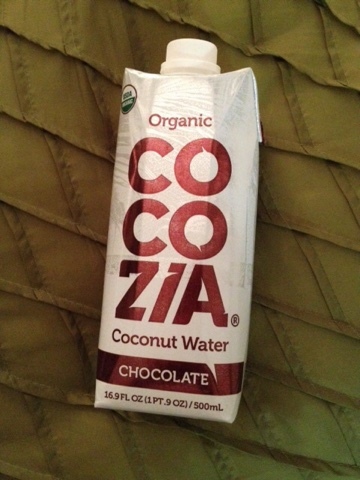 When Epicurex introduced me to Chocolate Coconut Water, I was more than happy to give it a try! Nutrients and chocolate? Yes, please. Adding a touch of chocolate to smoothies and a few recipes calling for water, has been a simple yet effective way to boost flavor while adding electrolytes such as potassium and magnesium (and more!) effortlessly! 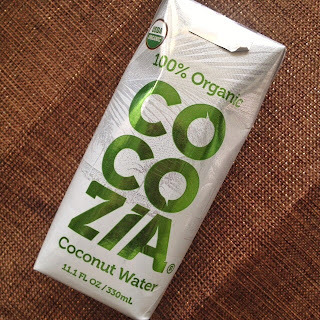 The intensity of coconut water, is muted with the addition of chocolate and a subtle coconut underlying flavor. It's a fantastic way to add a new dimension to your treats! These chocolate coconut muffins are a great, simple treat! 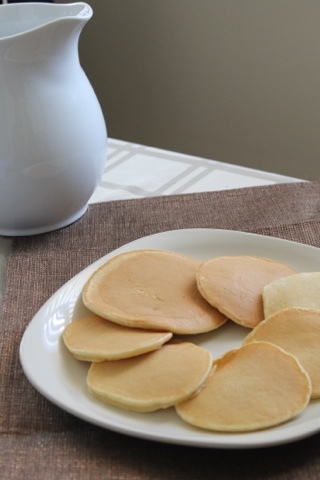 They are best served fresh with your favorite spread or a touch of margarine! With the boost of electrolytes and chocolate, thanks to the coconut water, you're only enhancing and not compromising the flavor at all! 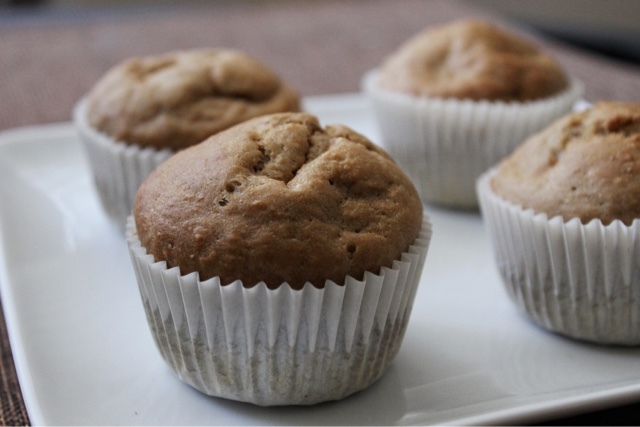 These muffins are best served fresh! They have bread like consistency and are wonderful with jam, cream cheese, margarine etc! 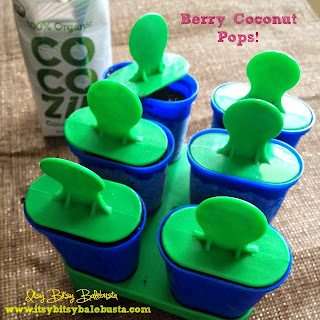 Epicurex provided me with a sample of Cocozia Chocolate Coconut Water to help create this recipe. The opinions, images and recipe provided, are all my own. With gratitude to Hashem, M & I are so excited to (officially) share special news with you! A couple of hours after Shavuot ended, we welcomed our newest member, who has brought a whole new meaning to itsy bitsy! Our strong, itsy bitsiest, newest little boy! That's right. We have two little boys under two! And while our hands are definitely full, our hearts have never been fuller! Absolutely LOVE my Happy Mommy Box, bag! Baby N, was born under 4lbs and had to stay in the NICU. 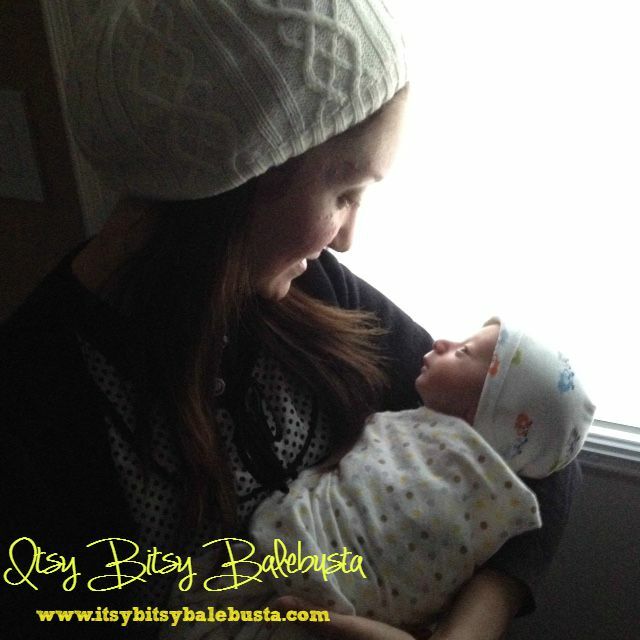 In only 9 weeks he has taught his Mommy what being strong means and is an incredible little superhero! As for big brother Y? When he's not busy editing and preparing guest posts for the blog... he's busy being the brother of the year! He dealt with his sense of normalcy being totally and completely uprooted and adjusted beautifully to our chaotic routine. This Mommy is super lucky to have two incredible little boys ka"h! We've learned a lot these past couple of months, and there's so much to write about! I'm looking forward to sharing our latest adventures, y'know between checking on the newborn, tripping over a Lego or ten and chasing a toddler! Be back soon with new adventures, fantastic product reviews and a few delicious recipes too! Hope you're having a wonderful summer! 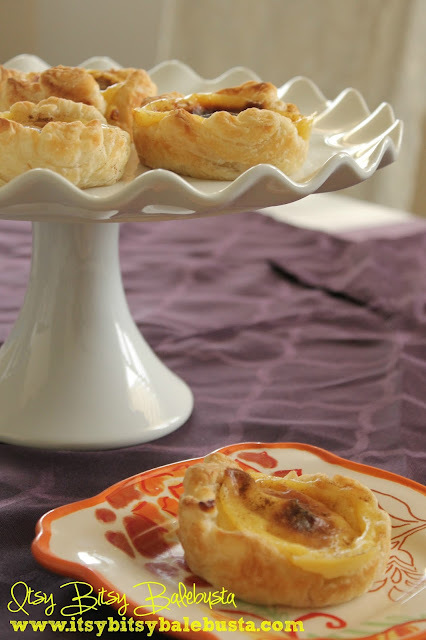 Pasteis De Nata & Ricardo Cuisine! A trip to the bakery! I’m fairly certain that I can trace my love of bakeries and baked goods back to those mid-morning trips with my grandfather to the bakery at the end of the street. Picking up fresh buns was a daily occurrence. The occasional loaf of bread or hot dog/ hamburger buns may have been purchased at the grocery store, but as far as buns or bread for our meals was concerned, nowhere but the bakery would do! To this day, my Dad still stops every Sunday to pick up bread for our Sunday dinners! And while helping my grandfather fill a bag with fresh, warm buns was fun, it was when we would head to the counter that the excitement would really peak. As I stared at the display cases filled to the brim with classic Portuguese desserts and pastries, the kind staff would, without fail, “sneak” me a cookie or treat! From walking through the door, to leaving with a bag full of that fresh scent and warmth, the experience was always enjoyable. When it comes to Portuguese bakeries, there is one dessert in particular, that is iconic. I can’t even begin to count the number of times, someone has asked me if I’ve made them. Having become kosher five years ago, the “is there anything you miss?” question is a popular one. Over the past few years, I’ve done what I can to transfer family recipes into ones that would accommodate and meet kosher dietary requirements. 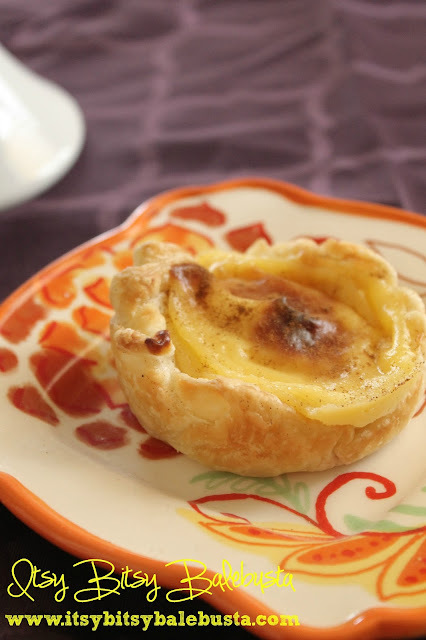 When friends learn this, pasteis de nata always seem to be the first thing they inquire about. I must admit, while I enjoyed them, they were never the first dessert I’d reach for. But sure enough, make something (especially a baked good!) inaccessible and it’s suddenly a favorite! Given that, I still had yet to attempt baking them, since I have never, NEVER, had a successful experience with custard or caramel. About a month ago, I was introduced to Ricardo Cuisine. I’m always on the lookout for fantastic food/ recipe websites, and while I certainly love a good cookbook, there’s something special about the ease of searching for a recipe and having a slew of results pop up within seconds. The Ricardo Cuisine site has definitely become a favorite of mine in a very short amount of time! Its crisp and clean layout showcases the food presented beautifully. The menu can be tailored to help you find exactly what you’re looking for. The drop-down menu underneath Cook breaks down your search into mains, appetizers, desserts etc. The Discover bar leads you to videos, a menu planner and further broken down categories (i.e. summer cooking!) and more! Add special features, a boutique, a magazine and themes (i.e. Cooking for Diabetics) and this website is as comprehensive as it is fantastic! The recipe, like the others I had browsed through, was so straightforward and accessible that for the first time, I really felt like I could attempt to recreate this classic! The added bonus of the fact that it didn’t require any gelatin or ingredients kosher versions of pasteis call for, was especially exciting! The recipe is inherently kosher! I made custard! It was a milestone moment in this Itsy Bitsy Balebusta’s kitchen! Another great thing about pasteis is that as long as you get the components right, the final presentation doesn’t have to be clean and fancy! 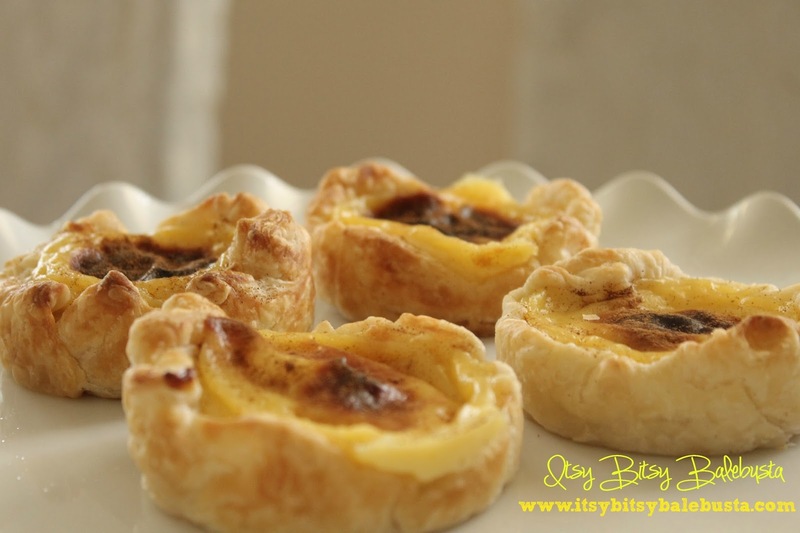 Pasteis de Nata are known for their almost burnt looking appearance. Take one bite though, and it won’t matter what it looks like! I’d definitely recommend taking a look at the site and using it to help you plan your next menu, meal or snack! The recipes are so great that something I’ve failed at before, I was suddenly able to make effortlessly. I wasn’t left with a sink full of dishes at the end (always a plus! ), I had all the ingredients I needed in the fridge and pantry, and everything was so easy to follow that it really felt effortless. The only alteration I made was baking each tart in a ramekin. 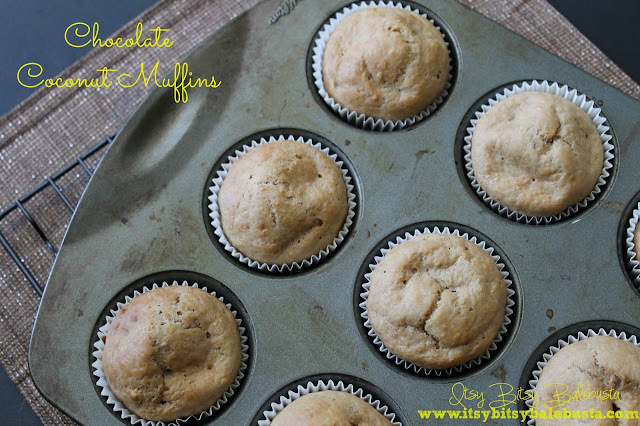 Truth be told, I didn’t have an appropriate dairy muffin pan, but in the end it was a great option! I was able to make slightly larger pasteis than the traditional ones (and really, is extra custard and pastry ever a bad thing?) and didn’t have to worry about any custard spilling out during the baking process. I generously greased them beforehand and baked them at 500F. All in all, not only is it a beautiful site to browse through, but you’ll both want to make the recipes and enjoy the seamless process almost as much as the final product! Now if you’ll excuse me, it’s been about five years and I have a few extra pasteis waiting for me! 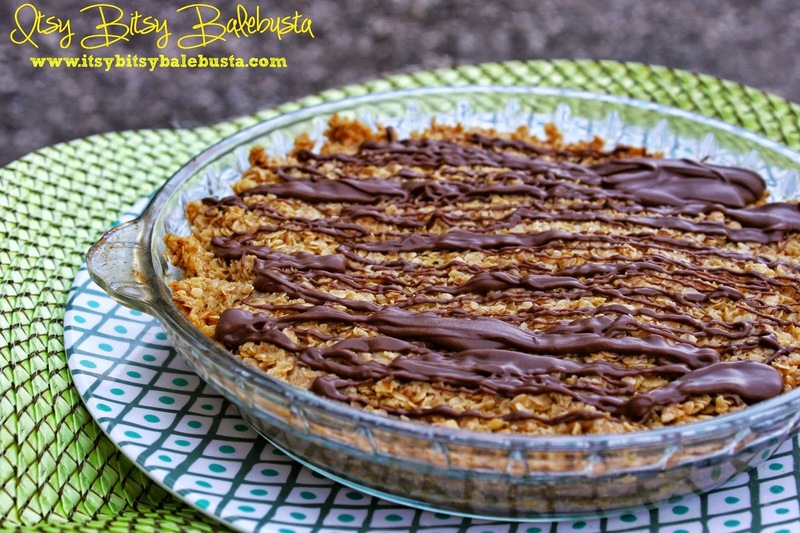 Flourless: Recipes for Naturally Gluten-Free Desserts & A Giveaway! After all of the Passover cooking, who doesn't have a renewed sense of appreciation for those who go all year round without gluten? While there are those who will be quick to say that 8 days isn't so bad and that they have their favorite Passover desserts/ recipes - maybe even a few they use year round - reaching for flour-filled cakes, cookies and bread after the holiday, is always welcome. Having the ability to only have to limit our flourless intake to eight days a year is a luxury! Being the only one in my family who keeps kosher, I'm sensitive to having food available to meet any dietary requirement. It's such a central part of gatherings and truthfully, our heritage. I'm incredibly, incredibly fortunate to have parents who are not only understanding but also super accommodating. They've gone above and beyond to provide M with a BBQ and always ensure we have what to make/eat when we arrive at their home for Sunday dinner. With Y a part of the party now, it's amazing to see the variety of snacks and treats my parents always have on hand for him. He never has to feel like he's missing out! While planning Y's birthday I did my best to take into account that a few of our guests wouldn't be able to partake in most of the sweets. While there were fruit and veggie options on the table, what kid would enjoy going to a party where they couldn't have cake or candy while everyone else around them was? 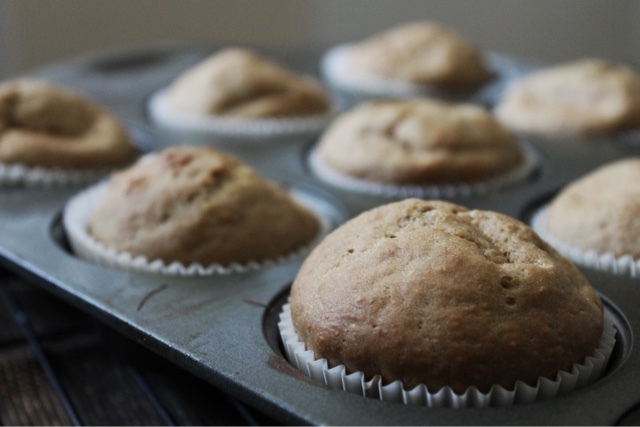 I was nervous to attempt to bake anything myself, with all the flour constantly floating around the kitchen, and it took having to search for delicious gluten-free kosher options, to realize the shortage of availability! 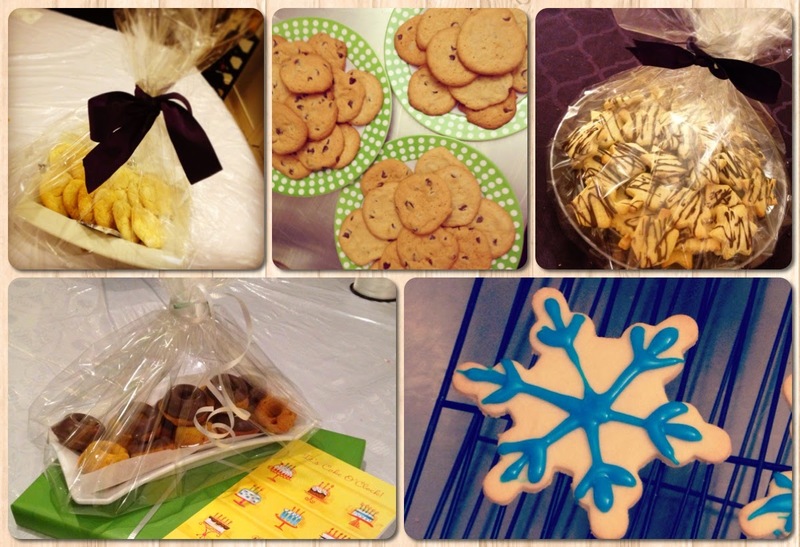 In the end we made individual bags with plenty of candy, iced brownies from a local gluten-free bakery and more! My respect and admiration is endless for families that have this as a daily challenge. Given all of this, you can imagine that when I opened Nicole Spiridakis' cookbook, Flourless I was blown away. Nicole herself is not gluten-free, but her sister in law does keep a gluten-free diet. Nicole became obsessed with the idea of naturally gluten-free recipes after exploring the idea that it's "often easier to make desserts that did not call for any wheat flour at all compared to those that incorporated a gluten-free flour substitute." Truth be told, that was also another reason I was hesitant to bake anything myself for our gluten-free family members. While recipes are plentiful and easy to find, those that didn't include complicated/ expensive/ hard to find flour blends or gums, were in short supply. Nicole's cookbook is absolutely fantastic, and that's coming from someone who basically can't make it throughout the day without a baked good. I love that her cookbook is compiled of recipes that have easily accessible and inexpensive ingredients and don't require unfamiliar components to make gluten-free treats! Additionally, I think she makes an incredibly important point when she says that, "The main thing to keep in mind when creating flourless desserts is to not see them as substitutes for more traditional desserts... They're delicious in their own right." This cookbook is wonderful in all regards. The writing is clear, heartfelt and you can't help but be inspired to give it a shot, regardless of how far outside your comfort zone flourless baking is. I love the dark tone of the images, and how they showcase respective recipes in clear, real, natural ways perfectly complimenting their inherent structure and qualities. The styling and arrangement is perfect. You really question how these muffins, cookies and more could be gluten-free! That's right, I said muffins and cookies! Flourless holds within its pages recipes for Cakes, Cupcakes, Cookies, Puddings, Tarts, Candies and Confections among other treats. You're not limited to the soufflés and flourless chocolate cakes that all too frequently come up when you search for gluten-free recipes (although those are surely included as well!). Here you will find recipes for a flavorful Lemon Loaf, a delicious Apple Tea Cake with Maple Glaze and what will become your go to gluten-free Chocolate Chocolate Chip Cookies! The recipes are versatile, perfect for breakfast, dessert, to gift and more. You can bake them seasonally and enjoy summer picnic or Thanksgiving go to's, from berry pies to pumpkin bread (yes, bread! ), or enjoy them year round. You'll also find bold flavors such as ginger, sesame, tahini, rosemary, pistachio and more, to expand your palette! The array of recipes goes above and beyond to provide you with a comprehensive collection of options that leaves you with plenty of inspiration, rather than feeling overwhelmed by the lack of availability to muffins and more. 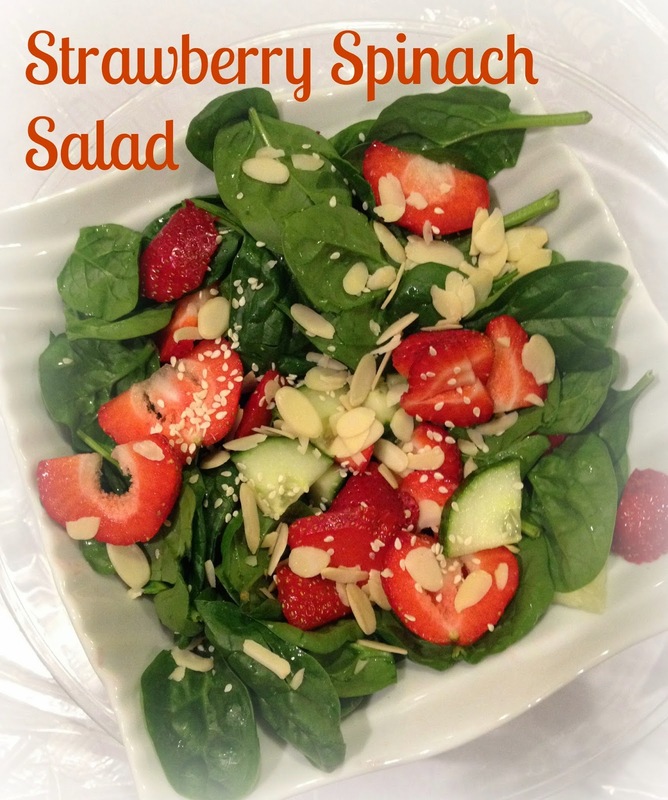 Quick & simple to make, with easy to find, natural ingredients! A total hit here! Given how inspired I was by this cookbook, and how great my appreciation is for families and individuals who face the task of altering their menu to comply with a gluten-free diet for any of a variety of reasons, I'm so excited to be able to share a giveaway for this cookbook, courtesy of the very generous Raincoast Books. You can enter below and I hope this cookbook brings plenty of inspiration and warm delicious delights into your kitchen and home! Good luck & enjoy! Open to Canadian residents. No purchase necessary. Skill-based question will be asked upon drawing winner's name. Prize is one (1) copy of Nicole Spiridakis' cookbook Flourless provided by Raincoast Books, approximate retail value of $38.95. Odds of winning are dependent on number of eligible entries received. Contest will run from Monday April 20th, 2015 until Sunday April 26th, 2015 at 12:00 am EST. Handmade Gifts From The Kitchen! Versatility in life while cooking and in the kitchen is essential. The ability to swap ingredients or alter recipes, especially for the kosher cook (or anyone with dietary guidelines to follow, be it for allergies, intolerance etc) comes hand in hand with prepping meals! When that versatility expands to cookbooks, you know this Itsy Bitsy Balebusta is thrilled! I rarely accept an invite to a meal without offering to contribute (unless Y is having a particularly fun – read 'challenging' – week, oh teething!). Also, living on a budget, we usually opt to bring a baked good, plated and wrapped, as a hostess gift, when we make it out. Special occasions from Chanukah to birthdays also always include a little baked treat from our kitchen! I love the personal touch it adds to a gift, and I always make an effort to include favorite flavors, themes and recipes! Who doesn't love a fresh homemade dessert? Given all of this, I was thrilled to receive this stunning cookbook. 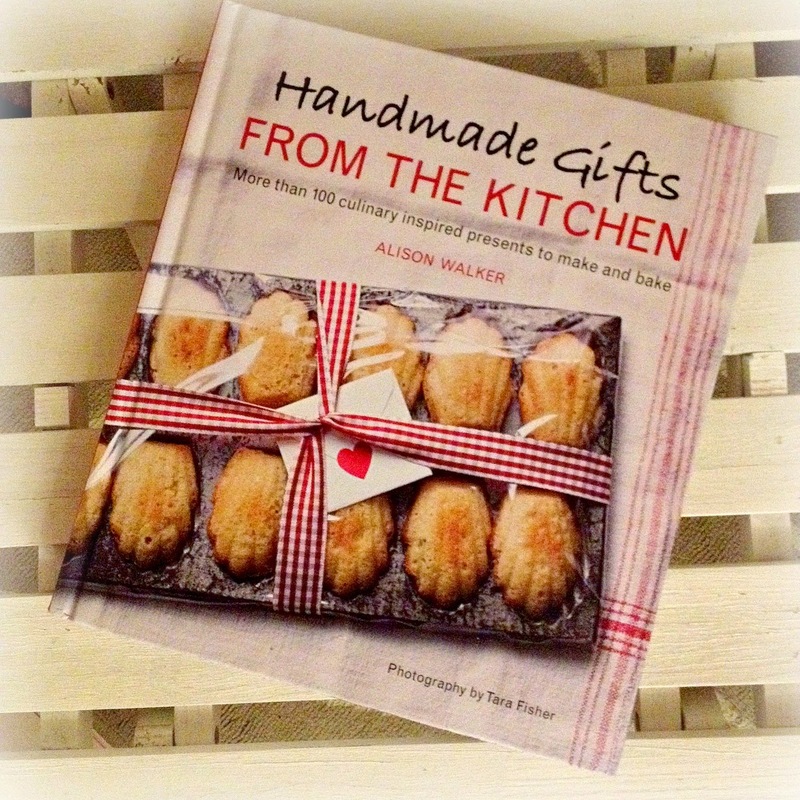 Alison Walker’s, Handmade Gifts From The Kitchen, is a beautiful, instructive, creative collection of recipes, ideas and tips. Not only is this book filled to the brim with fantastic recipes, notes on packaging, presentation and assembly, it inspires and encourages you to get into your kitchen! One of my personal favorite recipes, is simple and classic, and sure to become a go-to. 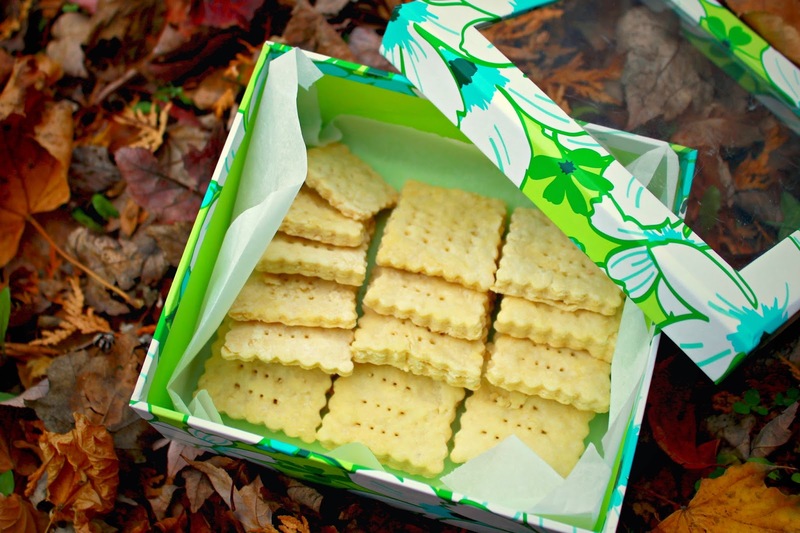 The Poppy & Sesame Seed Crackers, are super easy to make and with a bit of parchment paper and a lovely gift box, you have a great gift ready to go! Add a few packets of tea, maybe some fruit or a Lemon Syrup Loaf Cake, also in the cookbook, and a wonderful Mishaloch Manos for a teacher, neighbor or friend and relative is set! This would also make for a great end-of-year gift for teachers, with a special personal touch! The creativity continues with Chocolate Button Shortbread Cookies. These would be a fantastic addition to a teddy bear themed Mishaloch Manos, or alternatively as a treat for a new Mom, with a little "Cute As A Button" gift tag attached! That’s the wonderful feature about this cookbook. You aren't just flipping through pages, finding ideas for dinner or dessert! Each page brings you inspiration for gifts and treats to share with your family and friends, beyond your dining table! And with some of the later recipes, that require time to sit after they're made, Alison is helping you to stock your pantry for, as she put it in her introduction, those moments when you need an impromptu gift. How many times are you running out the door to an event that was supposed to be in the calendar but somehow got mixed up and have to plan extra time to stop and pick up a little hostess gift? With these incredible recipes, you'll have an arsenal of gifts ready at a moments notice (or as a special treat for yourself too, on those especially long days!). The recipes are not only sweet based. There are plenty of simple, savory options as well! These range from marinated olives to BBQ sauce, pumpkin relish, and a variety of chutney and mustard! There is even a From the Garden section as well as the Raise a Glass chapter, which includes recipes for liquors and vodka. Yes. This book literally has everything! An exceptional lineup of gifts you can make from your kitchen is tucked between these pages! And not only are the treats gorgeous in their own right, they're also versatile and can be used as decor! The Stollen Wreath for instance, doubles as a fantastic centerpiece! By the last page, you're so inspired that you see multiple uses for common gifts and have plenty of your own packaging & gifting ideas as well! There are recipes that are simple enough to include the whole family, and what better way to get everyone involved in Purim preparation, and help kids add their own personal touch, than in the kitchen! Sure, there will be some mess, and it may take a bit longer, but the memories and pride of presenting their friends and family with something they've made is totally worth it! As Alison shares in her introduction, and I agree, "true pleasure comes from sharing food!" And yes, anyone who's made a hostess gift or Mishloach Manos can tell you, that while prepping all of these items is time consuming, it's also oftentimes less expensive than purchasing gifts. Add the bonus of the joy of sharing something made with a personal touch and love and what could be more special? This cookbook also goes above and beyond to help make the whole process as easy as possible, with resource guides to where to buy packaging and materials, as well as ideas for how to plate and present the items! There's info on when to bake before gifting, how long in advance items need to be prepared, or how long they should marinate/ sit before being given and so much more. Overall, this is a gorgeous book, brimming with inspiration and absolutely stunning images, any of which I'd love to have framed in our kitchen! It's versatile, both inherently with the multitude of recipes and ideas included, and in the sense that you'll be pulling it off of your shelf every Purim to add that special, unqiue treat to your Mishloach Manos, as well as for any Shabbos you find yourself going out, any time you're a guest or any time the opportunity to brighten someone's day with a little baked treat presents itself! And the great thing about this book is that you'll find yourself looking to do so more often, just to flip through the beautiful pages and experience the joy of sharing Handmade Gifts From The Kitchen! Disclaimer: This cookbook was provided to me by Appetite by Random House. All opinions contained within my review are solely mine. How to Plan A Stress Free Party Part 2: Setting Up & Layout! This series will provide a comprehensive look at our son’s first birthday party, and serve as a guide filled tips we learned along the way. 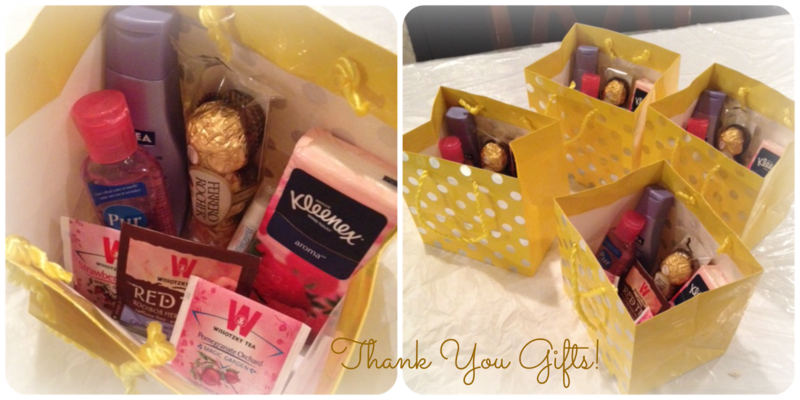 It's our hope that it'll help make your little one’s special day as minimally stressful as possible! After all, the less time you spend preparing and setting up, the more time you'll have to celebrate and focus on the day! When I searched for tips for Y’s birthday, I couldn't really find anything comprehensive (and especially when it came to boys birthdays!) so although these posts may be a bit lengthy, I hope they give you some ideas and help you with your celebration! After months of going back and forth on a theme, we finally decided to go for a more generic theme rather than characters, and all the ideas we had previously floated around. As much as our son absolutely loves Rio, we kinda figured this would be the only year where he wouldn't straight-up give us a theme, and where we could really, really focus on him and the awesome little boy that he is (rather than on his favorite movie and so on). Gd-willing, there will be plenty of birthdays ahead full of that! It also opened the door for us to create a lot of our own decorations, invitations and so on, without spending money on the party items we had passed in various stores, while attempting to stick to a budget! And so we decided on Mr. 1-derful! 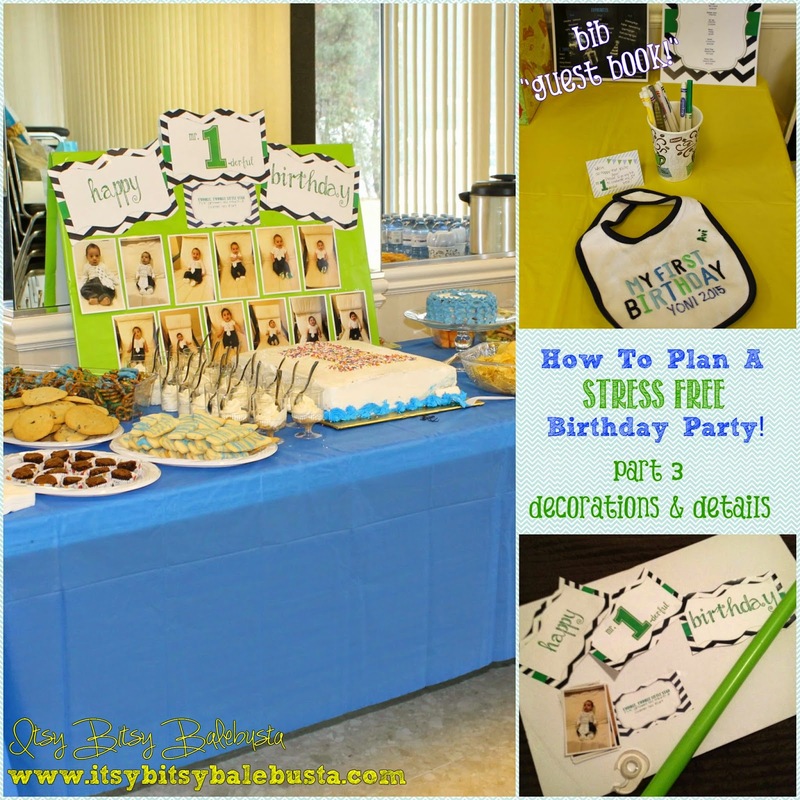 After the theme was set, we decided to go with blue and green for the color scheme, since it was easy to work with, and plenty of boy birthday ideas I had seen, complemented it well. I also threw in some yellow since it seems to be Y’s favorite color! We purchased plastic tablecloths from the dollar store, together with simple green and blue paper plates. We doubled-up on the quantity needed, in case guests wanted a separate plate for sweets and veggies. At the end of the party, we wrapped up the mess into the tablecloths and disposed of them! Super easy cleanup and nothing to worry about if there were spills or other incidents! We set the party from 1-3, just long enough to be a drop-in where everyone could enjoy sweets and refreshments but not so long that Y would get fussy or bored. Also, we purposely scheduled it for after his nap time so that he could be well rested! It happened to be Superbowl Sunday, and we wanted it early enough in the day that it wouldn't interfere if our guests had plans. Lastly, we definitely know how valuable Sundays are in general, being one of the only days in the week where we’re really able to get out and take care of errands etc, so we didn't want to impose on anyone’s day off either. The length of time and the timing itself ended up being great, and we were really happy with it. We booked the room from 12-4 to allow an hour for setup and an hour to clean up. In the end, we only needed about 20 minutes to set up – I came prepped with a map of the layout, what would go on each table and had separated items into corresponding large reusable bags for each table, to make setup as smooth as possible. We also had a friend of our's and my family arrive a little early and their help was invaluable! My Mom got some bonus time with Y, while my sister and Dad helped move and set the tables. Cleanup extended a little past our 4 pm deadline, since guests left a little later than 3. All points to consider when booking your space, if you’re having a party outside of home! The room we rented was a simple party room in a condo building, through an incredible friend of our’s. It was large enough to hold all of our guests comfortably and provided tables and chairs. Living in a small apartment, we didn't want everyone to feel crammed and for kids to have no where to really go. This option offered us the space we needed, as well as the bonus of keeping all of the mess and traffic outside of our home, at a minimal cost. We wanted to have an intimate yet open setting, and other rental options such as indoor play places and larger party rooms compromised that. This option was the clear winner! The set up was very simple. A large rectangular table with a blue tablecloth against one wall, with a smaller square table attached to it. This was our main table. It hosted the trays of baked goods, our fruit and veggie trays, the cakes (yes cakes, more on that later in the series, when we talk all about the food! ), and napkins, plates etc. The small adjoining table held the coffee urn and drinks, together with cups, spoons and so on. It was against a wall on the far side of the room, the first thing you saw when you walked in, but out of the way enough to leave plenty of area to walk around and socialize, or take something from the table without feeling crowded. I didn't want to position it in the middle of the room, (although that layout is great if you have the space, since it allows everyone to walk around and effortlessly take from all angles) since it minimized the amount of space and would be a huge obstacle for all the kiddies moving around! Depending on your guests and the layout of your room a different option may be more suitable, but against a wall on the far side of the room, was the best option for us! The second table was directly across the room from the main one. It was covered in a yellow table cloth, and was a place to keep all of the gifts, our family and friends so kindly and generously brought for Y. It also held one of my favorite details of his party – a, My First Birthday bib, where all of our guests were welcome to sign their names, as a sort of guest book and memento of Y’s first birthday party! It was a hit and is a cute way for us to be able to look back and remember who was a part of Y’s special day. Full details in our next post! Next up, and possibly the best idea of the three tables, was the coloring table! I searched Pinterest and found a variety of coloring sheets and printed out approximately 2-3 copies per child, of each one (just in case someone made a “mistake” or really liked a particular one, there would be enough to go around). The specific sheets we used can be found here and here. I also created our own coloring sheet, using a simple word document. I used the same fonts M used to create the motif for the invitation, and simply applied a word art filter to make them just an outline. It created a unique coloring page, that included the theme perfectly and easily! I loved this aspect of the party, because it gave the children something to do while their parents got to socialize, it was age-appropriate and everyone from the two-year-old to the eight-year-old were super excited to color! At the end we were given a whole bunch of beautifully colored-in sheets with notes to Y, which I hope to compile into a little book for him! It was a cute way for the kids to keep busy and contribute to the party and it helped to avoid any running around or boredom! Definitely a hit! Again, all it required was a plastic tablecloth, 2-3 of each coloring page per child and 2 boxes of crayons from our local dollar store (since it’s inevitable that more than one child will want the same color at the same time!). We brought along Y’s travel high chair that buckles onto a regular seat, so that he would have a secure and steady place to enjoy his cake or take a rest. It also doubled as a great area where guests took turns taking photos with him! After all of the adorable high chair decorations I had seen online, we actually opted to purchase a highchair decorating kit, since it came with the banner for the tray as well as a mat for underneath the high chair, to catch any excess cake or treats. We found one with animals and a “Fun To Be 1” message! It was part of a larger set of decorations, but we felt it was generic enough that it could blend in seamlessly with the rest of our décor! It was an excellent and easy touch to dress up his special seat and the mat helped with clean up at the end (especially since it was a rented room and wiping blue icing off of the floor after a party wasn't something I was interested in doing!). I hope this has given you some ideas to help make the setup and layout for your little one’s party less stressful and more attainable! Join us for our next post where we fill you in on the decorations and how we opted for quick and easy homemade pieces that added a personal touch to the room and celebrated our little boy’s milestones over his first year! 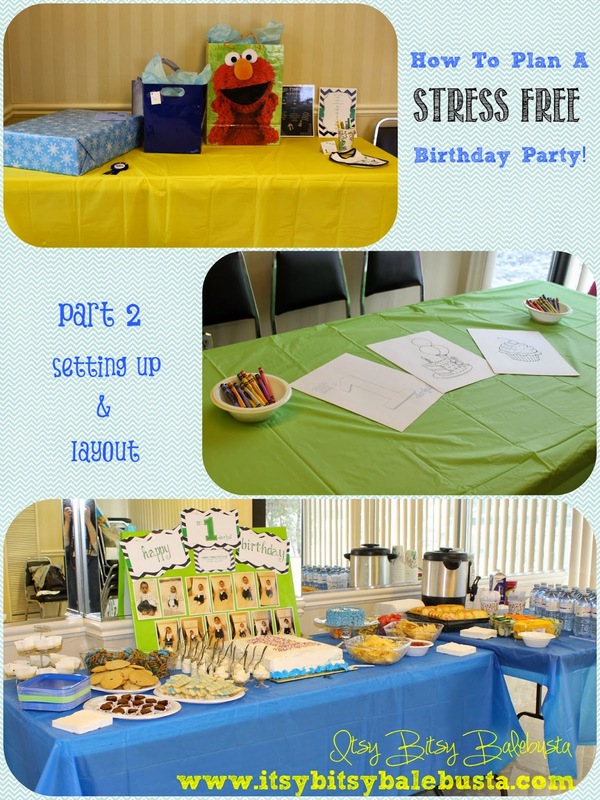 How to Plan a Stress Free Birthday Party! While I could sit here and tell you all about Y’s first birthday party for the next oh, year or so, I thought I’d approach all of the celebrations from a slightly different angle! It’s absolutely surreal that a year has already gone by since this little boy made his grand entrance into our lives, and we are so incredibly grateful for all of the milestones and moments that have been cause for celebration from the very first day. This first year as parents has been quite the roller coaster ride. From weight issues, to colic all the way to smiles, first words and so much love, this little guy has pushed us to grow in so many ways over the past year! How do you fit all of this into one day of celebration?! Well, we opted for 2! On the day of his birthday, we decided to celebrate together, as our little family of three. We took Y to a play place where we were amazed and really had the opportunity to realize how much he has grown, and how independent and adventurous he has become! He spent the afternoon crawling and cruising everywhere and exploring everything! We even got a glimpse into the next stage of parenting when he started to whine when M picked him up, to leave! Once home, all whining was forgotten, when the celebrations continued with his first taste of cake! A few days later, we had a larger celebration with family and friends! The party was absolutely beautiful and it was so wonderful being able to see people who provided so much support and love over Y's first year! We couldn't have hoped for a greater way to honor our little boy's special day, than with all the love, laughter and smiles that filled the room! I want to take this opportunity to share with you a few tips and tricks I picked up, to help plan and pull off a stress free birthday party! I’ll be the first to admit, that I can be over-ambitious at times and that more often than not, stress bubbles to the surface and my elaborate plans and to-do lists begin to go askew. Considering I started pinning ideas for Y’s birthday a long time ago, the running game plan resembled more of a wedding than a birthday party. That’s the wonderful and awful thing about Pinterest. I had pinned 3-tier cakes alongside “simple and easy decorations”. It was a huge mishmash of stuff and I was overwhelmed before I even really figured out a theme – which I changed at least 4 times! And with that here's my first tip, for successfully planning a stress free birthday party! I literally want to frame that quote in every room of our home so that I can see it all the time. I realized, that in my pinning and planning fury I had neglected remembering two very important points. 1. This day is about Y. Not about how many crafts I can make off of Pinterest. Not about how many desserts I can squeeze onto a table. Not about how many videos I can watch to learn how to pipe a cake or cupcakes or anything like that. This day is not about Mommy or a show and tell of all the things I can do. This day is about Y! 2. I need to learn to let go. Accept that things are going to veer off course and that at the end of the day if our little boy is smiling then the party was a success no matter what. I didn't realize how strongly her words had affected me, until approximately 48 hours before the party, when we got word that there was an issue with the party room we had booked. Y'know, the place where all of our guests had received invitations and directions to. The place we found and booked a month and a half in advance. Yeah, we were getting word about an hour before Shabbos that we may not have access to the room. Luckily for us, one of our closets friend’s sorted it out and everything was back on track! Also, the menu. Oh the menu. You should have seen my rough drafts of ideas! First I wanted to do a buffet style of all of Y’s favorite foods, but in more grownup versions (I doubt anyone would be heading for seconds of sweet potato puree or baby cereal!). I was thinking sweet potato fries in mini take out containers for instance! Then I saw a pin of scoops of ice cream in mason jars, with little bowls of toppings laid out on the table and an ice cream/frozen yogurt party was the new theme! Then we jumped to Toy Story, Rio and a bunch of other themes that he seemed to show interest in throughout his first year! Each one included endless decorated desserts, that even though I knew I was totally incapable of creating, or were way out of our budget, envisioned on the table anyway! When I took the time to stop and realize how what I was really doing was using this party as an outlet to decorate a table and make food and socialize after a year of being home with a baby and basically having only my husband and mom to communicate with on a daily basis, I scrapped everything. This day is supposed to be solely about Y! I will admit that making the baked goods and his cake was important to me though. I wanted his first taste of sweets to be from his Mommy’s kitchen, and after a year of only eating homemade and healthy food, throwing him into a party of sugar and icing and store bought goodies worried me. So I came up with a plan! And with that plan came a theme that was all about Y.
I hope you’ll come back this week and follow along our posts, for more tips on decorating and baking in preparation for a stress free birthday party, for your special little one!